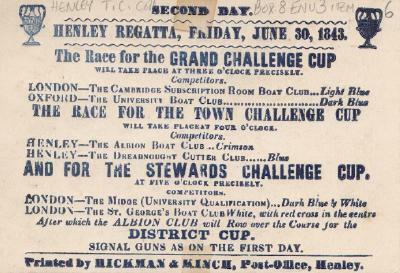 Racecard for the second day of Henley Royal Regatta on Friday June 30th 1843, detailing the Grand Challenge Cup race, the Town Challenge Cup and the Stewards Challenge Cup. Henley Royal Regatta programme commemorating the visit of HRH Princess Elizabeth on the 6th July 1946. "Regatta Night at the Angel" Newspaper cutting (Sunday Telegraph, 28 June 1964) with article on swans on the Thames at Henley being rounded up in preparation for the Regatta. 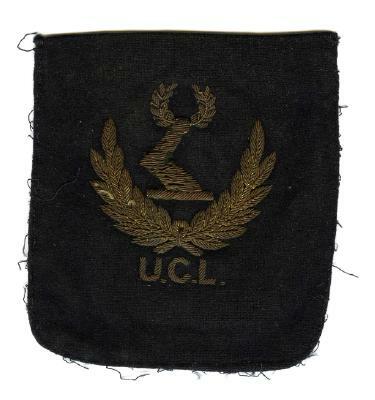 Blazer badge - University College London. Belonged to Kerry Hennessy, who rowed with University College London Boat Club when they won the Wyfold Cup at Henley Royal Regatta in 1956. A Leander Club Reservation Booklet 2000, for Henley Royal Regatta. Rectangular shiny card booklet with a taped binding. Pink lettering. Large Leander Club badge on the left. Text reads "Leander Club, Henley on Thames, RG9 2LP; Henley Royal Regatta; June 28 to July 2 2000. 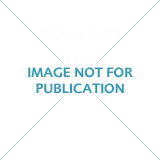 Reservation Information". Six pages inside with meals and prices available. 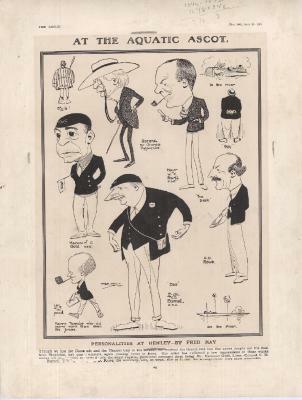 Page from Tatler 'At the Aquatic Ascot - Personalities at Henley - By Fred May' Published on 13th July 1921.
Henley Royal Regatta book of "Rules of Membership and List of Members of the Stewards' Enclosure", 1955. From the effects of JG Vincent, a former member of Royal Chester Rowing Club. Leaflet for the Heney Royal Regatta Steward's Enclosure Catering and Bar Services privided by Letherby & Christopher, 1996. 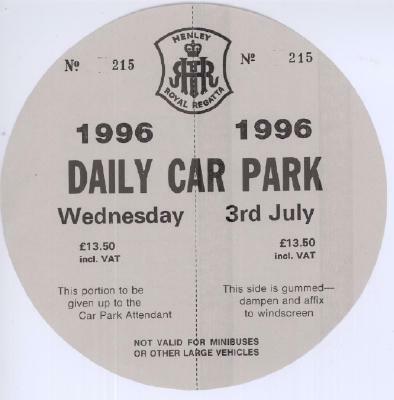 Pass for the Daily Car Park at Henley Royal Regatta valid on Wednesday 3rd July 1996. Unused. Issued by Henley Royal Regatta. Souvenir programme for the celebrations for the coronation of King George V and Queen Mary held in Henley on Thames, June 2nd 1911. Printed by Higgs & Co of Henley.